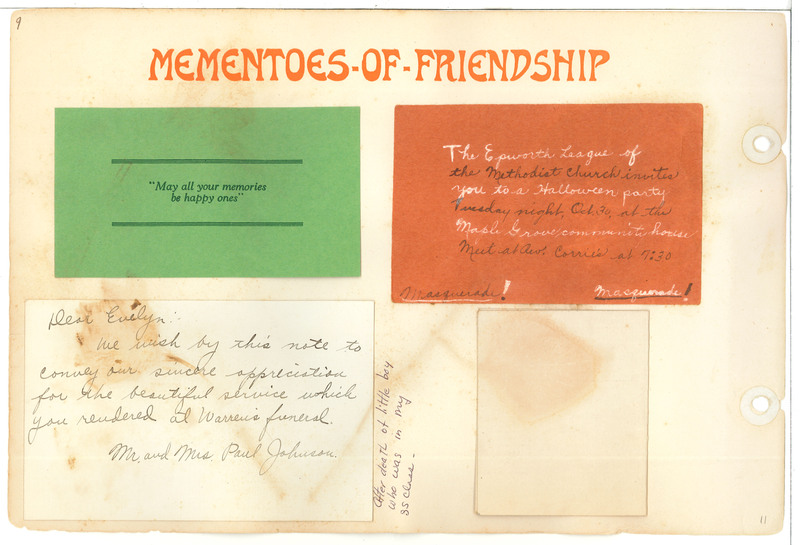 9 Mementoes-of-Friendship "May all your memories be happy ones" The Epworth League of the Methodist Church invites you to a Halloween party Tuesday night, Oct. 30, at the Maple Grove community house Meet at Rev. Corrie's at 7:30 Masquerade! Masquerade! Dear Evelyn: We wish by this note to convey our sincere appreciation for the beautiful service which you rendered at Warren's funeral. Mr. and Mrs. Paul Johnson. After death of little boy who was in my ss class.